I’ve been wanting to eat onigiri for the past few days but could never wake up early enough to cook rice in the morning. Last night though, I smartened myself up and cooked copious amounts of rice for dinner! Then, I slathered the rice in the pot with sushi vinegar (I like my onigiri rice sushi-like), packed them in two onigiri-sized baggies, then froze everything. This morning, I simply took them from the freezer then nuked on high for a minute or two then yay! I had onigiri to go! For today’s onigiri, they’re totally nori (seaweed). 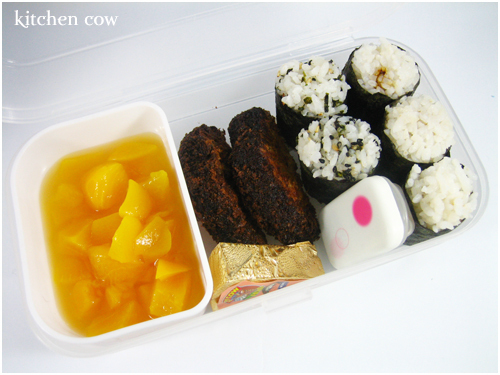 The plain white ones on the right are stuffed with Gohan Desu Yo!, a seaweed paste made by Momoya. When I first heard of this from Lunch in a box, I was very, very intrigued. Especially when it was featured on the Yakitate!! Japan anime as well. It’s quite interesting, having nori both inside and outside my onigiri. Honestly, I couldn’t taste it all that much, I guess I put too little, but it was not unpleasant. The spotty onigiri was dusted with seaweed furikake. No, it wasn’t intentional, I just grabbed the first packet of furikake I could and surprise! It was nori. Happy lunch. Happy wallet. Onigiri cravings appeased. Mission accomplished! Let’s just hope tomorrows bento plans won’t be overruled by the desire to sleep again. I have a couple of questions for you: what kind of rice do you recommend for making onigiri. I use wagwag, but sometimes it doesn’t have the same consistency that I find in japanese rice. And second ? : how do I find sushi vinegar? is there a brand that I should look for in the japanese groceries? how much do I plug into the rice? Sorry that’s 2 additional questions, four in all. I have a special stash of Koshihikari or other short-grained Japanese rice at home, kept exclusively for onigiri and sushi. Just recently though, we bought some Dona Maria Jasponica rice and while it’s long-grained, it’s sticky-dry enough for onigiri. It’s still loads cheaper than koshihikari, at around 50 a kilo vs. 100 or so for Japanese rice. A lot of people don’t use sushi vinegar for onigiri, but personally, I like the additional flavor it adds so I prepare it like sushi rice. Sushi vinegar can be bought bottled (Mitsukan Sushi Vinegar ) or made using plain Japanese vinegar that’s heated, sugar, some salt (likewise, I have a recipe at home, I’ll post it up). If you’re not worried about MSG and prefer speed, another alternative is to use Tamanoi Sushinoko , a vinegar powder that you can dust on the freshly cooked rice. As to the amount to put in, some cookbooks recommend certain measurements but mostly, I just wing it by adding a couple of tablespoons at a time until I get the intensity I want. kitchencow, is sushi vinegar same with mirin sauce? Nopies! Mirin is closer to sake. It’s sweet sake for cooking actually. It’s a staple Japanese cooking ingredient though, and is quite useful to have in the kitchen if you like Japanese food. Sushi vinegar is rice vinegar that has sugar and salt (and other ingredients maybe?) added to it so you just have to pour it on your rice to make sushi rice. Hi kaoko. I’m glad that Dona Maria Jasponica Rice works great with your onigiri. You could also try Dona Maria Miponica Rice as this is stickier than Jasponica Rice. Also, have you tried brown rice sushi? My manager was able to make it using Dona Maria Jasponica Brown Rice. Rice/Water ratio is 1:2 and no need to soak it. It tastes the same as regular sushi only healthier. If you have any comments or inquiries feel free to email me. Are you from the company that makes Dona Maria? If you are, congratulations, you have a very good product there. I haven’t tried the Miponica but I’ll be sure to give it a shot. I tried cooking brown rice recently, and while I wanted to try the Dona Maria, I confess, I found it a bit expensive so I tried a generic brand, because I was worried I wouldn’t like brown rice at all. Next time, I’ll be sure to try the Jasponica kind. Actually I’m the son of the owner so it’s a family business. Thank you also for using our rice.=) We are proud that we have a rice that can compete with imported brands at last. An agricultural country like ours shouldn’t lose to Thailand, China and Japan for quality rice. Feel free to tell me if you have any comments or feedback from our rice. I will be happy to help. Pity, had to skip WOFEX. No funds for shopping. Hi, I was wondering if you have ever prepared the onigiri the night before? I make most of my Bento lunches the night before and keep it in the fridge. Then they are also kept in the fridge during the day leading up until lunch time. I am curious how this would effect the onigiri and the nori wrapped around it. Also, at what temperature onigiri is generally eaten? I’ve made onigiri in advance but I usually freeze it, then reheat on high in the microwave in the morning. Of course, this limits my stuffing options so at times, I just opt to freeze the rice then mold in the mornings. The nori, I usually add before packing in the bento. Hope that helps, Jennifer! Thanks for dropping by.